Heads up displays is more commonly referred to as a Car HUD and work by connecting with your cars OBD port to retrieve real time data. The data can be in the form of your current speed, temperature, battery voltage and much more. The best car HUD is the Autolover A8 Heads Up Display, which uses a 5.5 inch display and multiple symbols and colors to intuitively display real time data. Although they feature on fighter jets and a standard on many high-end vehicles, they are very simple to install. It is a simple “plug in and play” device that connects to the OBD port with very little to go wrong with the installation. The main reason many car enthusiasts decide to install a car HUD is due to the fact it provides instant information in the “line of vision”. This is great for safety as your eyes remain on the road but it is also an excellent gadget to show off to passengers. Many desirable features of a car HUD include auto luminosity, multiple forms of real time data, large displays and much more. Going for a cheap HUD for your car will result in a bad experience and we highly recommend the premium examples. If you drive an older car without an OBD port, you may need to rely of your phone for real time data. Your phone will be able to retrieve GPS speed, time and all other phone data such as incoming calls and messages. Below is a list of the best heads up displays for your car that provide instant real time data. This car HUD uses multiple colors and symbols that makes differentiating between different data much easier. Many other alternatives use the same color with far too much data all in one screen, which makes usability far worse. Overall, it is the best car HUD that is easy to install and visible during the day unlike many of the cheaper alternatives. Not every driver will want a huge display that shows information that they are not really bothered about. The main real time data that most drivers want to have clear vision of is of course the current speed. This LearningTech car HUD does just that with a green light display that is easy on the eye and clear to view. The speed is retrieved via GPS, which is more accurate than your cars speedometer and its compatible with all vehicles with no OBD connection required. Features of the LearningTech Heads Up Display include MPH and KM/H compatibility with a single button click, fatigue and over speed alarms and an auto adjust brightness via a sensor for day and night driving. Overall, it is the best HUD speedometer without all the extra information such as the battery voltage, which 99% of drivers will not be worried about. The Arpenkin X5 has a 3 inch display that connects to your vehicles OBD port in order to retrieve data. It also makes use of the latest “nano technology” to eliminate unwanted reflections that is seen with the majority of cheap car HUDs. Compared against the more expensive car heads up displays available, it is much cheaper yet displays all the data that you would need. Overall, it is the best car HUD for the money with the 3 inch compact display providing clear visibility of data. The XYCING HUD features a 5.8 inch display that features all the main real time data parameters such as current driving speed, engine RPM, battery voltage, driving time and much more. It also features a built-in light sensor for automatic adjustment of the brightness so that it can be used in both day and night driving. It connects straight to your vehicles OBD2 port and when you turn your vehicle on or off, it will automatically shut on or off. Its important to check whether it will work with your vehicle as not all will support the OBD connection. Overall, it is a top rated car HUD with all the features that you would expect but the price may put many off the XYCING HUD. The Kivic Heads Up Display is the main competitor to what was the best car HUD the Navdy. Its a premium example that features a 10 inch display that is able to display various application such as Waze navigation, Google Maps and Apple Maps. It also supports car backup camera functionality for safe parking as well as the basic real time data such as speed and much more. On top of this, it syncs with your phone to display incoming calls, texts and other notifications. With all this functionality, you are probably wondering why its not rated as the best car HUD you can buy. This is primarily due to the compatibility issues with the iOS and Android smartphones, which when tested was fairly “hit and miss” as there were days with connection issues. This may just be our experience however but you may find zero issues with the HUD. We have used this HUD for many weeks and when its working, it will provide the ultimate HUD experience and its the best alternative to the Navdy. Navdy are the market leaders in premium heads up display devices and this model is by far the most popular. This is because it includes a full color GPS navigation that is powered by Google Maps for real time traffic updates. However, as many will already know, the company have gone into liquidation and many of the features have stopped working. There has been a lot of discussion via Reddit and of course many angry users of the Navdy as shown in this thread. There are many people still reviewing this product and mentioning it as the “best car HUD” and it did used to be but not anymore. Our recommendations above are the latest available and all work as they are designed too. 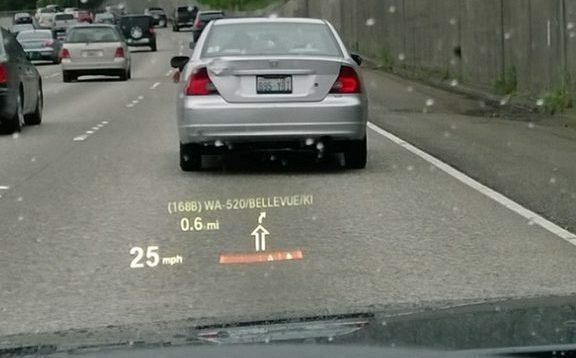 Heads Up Displays can turn your car into a futuristic military jet fighter but the main purpose is to provide real time data that you can view straight in front of you. This means your line of vision is always directed to the road, which results in an increase of driving safety. Many modern vehicles will have an OEM heads up display that will do everything for you but of course, this does come at a huge premium. If you own an older car or cheap car, the chances of your car having this already installed is fairly slim. Below are some factors that you should consider before purchasing the first car HUD you find. The majority of car HUD devices retrieve real time data via the cars diagnostic port (also known as the OBD port). From 1996, most cars will have this port located somewhere in their cars, which is usually below the dash but also underneath the car seat. However, not all cars will have an OBD, meaning the HUD will not work with the car. If this is the case, you have the choice of using a HUD that connects to your smartphone for real time data or just a plain basic GPS HUD speedometer. The display quality of the heads up display is one of the most important factors to consider. The whole purpose of the HUD is to display data that is easier to read and if its not clearly visible, it defeats the purpose of owning a HUD in the first place. Many include sensors that adjust the brightness of the HUD to match the time of day. For example, if its day light, there will need to be more illumination coming from the HUD in order for it to be displayed on the windshield and vice versa. The Navdy HUD used to dominate this market as it was the only HUD that had satellite navigation. However, there are many others available these days that connect with third party apps in order to display the navigation route on the HUD. Although this would not be as clear the a gps navigator system it is still an excellent feature to have. A HUD with GPS usually comes at a premium and our only recommendation is the Kivic HUD for GPS navigation. In order to save more money, you are probably best using a car phone holder that displays your navigation and have a separate HUD for real time data. HUDs that comes to a vehicles OBD will have access to a wide variety of parameters that they will be able to display on the car HUD. This is great but you will find many examples that cram as much data on a small display as possible, which makes it hard to view the data that you actually want to see. If you only want to view the speed, avoid going for a HUD that displays battery voltage, water temperature and other data. As a speedometer HUD is only suited to one aspect of displaying the data you want, it will do a better job in doing so. Installing a car HUD is fairly straight forward and provides excellent data that you can show off to your passengers. Some are more complicated than others and its down to personal preference on your choice of heads up display. If you have no OBD port, opt for a smartphone connection or purely a GPS HUD. Hopefully our recommendations have provided you with a better insight into the world of car heads up displays. Whatever your budget, there is a HUD for it, which will provide you with all the real time data you could need. Hi dan I want to buy a heads up display for my new Acura RDX 2019 tech package. Unfortunately I don’t have any heads up display already installed. It’s only limited to advance version of the RDX. I have couple questions before I buy heads up display. 1) Can installing a HUD can void any manufacturer warranty? 2) Which is the best one you recommend to my new Acura RDX? 3) I don’t know how to install to. Whom should I go to install it. An Acura dealer or an independent dealer? Hi Shashi – HUD is usually a very expensive optional extra from new and its better off saving money and opting for an aftermarket HUD. In terms of voiding the warranty, I would highly much doubt that but it would be worth just ringing the dealer and asking. All you will require to install one is run a wire through to the OBD port of your RDX. The AUTOLOVER A8 HUD is a really good piece of kit and installing again is easy. Any independent dealer will be able to fit a HUD, it would not take long at all. I hope this helps! Thanks Dan, will check my with dealer and install THE AUTOLOVER A8 HUD.